Like its comic counterpart, The Complete Aliens Omnibus Volume 1 is a book I believe anyone who has an interest in the older Aliens expanded universe should give a read. I don’t believe they are all perfect stories but I do believe they are essential reads in understanding the Aliens series as it is now. With Titan releasing all the old Bantam novelizations in volumes, it’s going to be really easy to get the complete collection in good condition. The Complete Aliens Omnibus Volume 1 contains the first three books that were written: Earth Hive, Nightmare Asylum and The Female War. These three books contain the core trilogy that kicked off the entire Aliens expanded universe and shaped a lot of the stories to follow. I have opted to review each book in the Omnibus separately. Originally published in 1994, the Aliens: The Female War novelization was written by Steve Perry, rounding out his work on the previous two instalments of the trilogy, this time accompanied by his daughter Stephani Danelle (S.D). Straight from the start the Perry’s have an unfortunate uphill climb as Female War (or Earth War as the comic was originally published as) wasn’t received that well. Both story and visuals were criticized for good reason making the original Aliens: Female War comic one that is nearly universally disliked. I will admit that I’m one of those who really didn’t enjoy the comic – but that is largely due to Sam Keith’s completely inappropriate visual style. However, I wasn’t blind to its narrative flaws. As with Steve Perry’s previous novelization, Aliens: Nightmare Asylum, Female War was a massive improvement over the original comic series. That’s not to say the book doesn’t have issues – it does – but it’s still light years a head of the comic in terms of overall quality and experience. 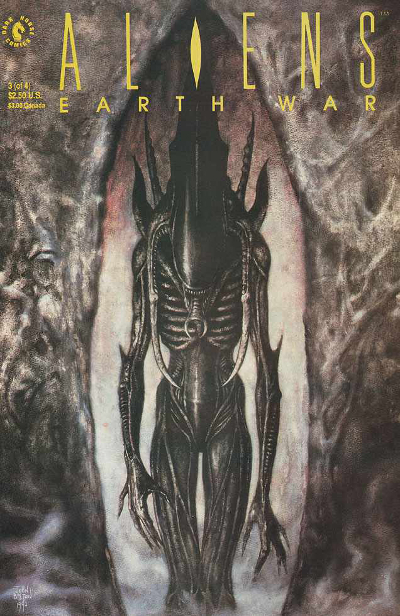 Cover art for the earlier release of Aliens: The Female War. Artwork by Dave Dorman. The novelizations had been the ones leading the way with the retcons that would attempt to allow those first stories from Dark Horse and Mark Verheiden to exist in a continuity where Alien 3 had killed Hicks and Newt. The third entry is where things start to get harder as Ellen Ripley plays a major role in it. Instead of simply renaming her character like they did with Hicks and Newt, the Perry’s decided to make Ripley a synthetic (the retconned comic version of Earth War, also renamed Female War and published in 1996 would not address the issue at all). I definitely preferred having an explanation rather than it simply being ignored but the explanation went nowhere. We never find out the who or why of Ripley’s creation. Ripley barely even questions it herself – instead having a metaphysical breakdown which, granted, I enjoyed. The revelation is led up to quite well, leaving several signs of a possible direction that when you know what is coming all make perfect sense – her aversion to medical staff, her huge gap in memory following the events of Aliens – but again, they are opportunities that just aren’t explored. For example, Ripley shows no interest in her missing memories and no concern over the fates of Newt and Hicks. I did really enjoy it when Ripley discovers the truth about her synthetic origins though. As someone who developed a distrust of androids in the films, it was interesting to see her come to doubt and severely distrust her own intentions. It also opened up a nice moment between her and Billie due to Billie’s own experience with finding out about Bueller in the previous books. There were also a few interesting tidbits on Ripley’s past such as Amanda’s inception being purely clinical. One of the criticisms that are often levied at Aliens: The Female War is the main premise revolving around the idea of the Queen Mother calling the Aliens back to her. Several of the main protagonists are also able to pick up on these dreams and ascertain the location of the Queen Mother. This is still very much present in the novel adaptation and I think it’s actually made worse in the novel. Since the first book/comic, it’s established that the Alien Queens are able to influence the dreams of others in some fashion. The way it is written in Aliens: Female War makes it seem like these dreams have always been from the Queen Mother, rather than localized Queens like it was always implied. There’s absolutely no lead up into this and feels very much out of place. The original comic built up to this much better with its prologue establishing what was happening. Ripley is awoken from cryosleep aboard the Sulaco and coerced into returning to the Derelict on LV-426 where she ultimately receives a message from the Space Jockey with all the information she needs to move the story along. Due to the some of the changes made in the novelization with how they handle the inclusion of Ripley, the original prologue would not have been appropriate so I can understand why that was changed. However, there was still place to build into it. The novelization opens with a recollection of events towards the end of Aliens, with Ripley and the Queen escaping the Atmospheric Processor. It’s a nice set up of the thematic conflict of mother vs mother but that opening could have been used to build into the notion of these being new dreams, different from before. One of the biggest changes made is the removal of the Space Jockey sub-plot. In the comics it is stated that the Space Jockey is using the Aliens to cleanse a planet of life. It then begins to terraform Earth so that it can claim it for its own. This plot is then quickly done away with in the short comic, The Alien. It is removed entirely from this book with the Space Jockey never appearing in the Bantam novels again (the set-up was included in the novelization of Aliens: Earth Hive). However, the characters still speculate that the Aliens are artificial weapons but this notion goes nowhere. It’s almost as if they are trying to justify the Queen Mother’s recall as a way for whoever weaponized the Aliens to be able to neatly clean them all up in one assault. Fortunately it works for humanity. But the notion of the Queen Mother attempting to call back all the Aliens, from all over the galaxy is a little on the daft side. How, exactly, the Aliens are supposed to facilitate this recall is never answered or speculated upon. John Bolton’s cover art for #3 of the original run of the comic series. This cover depicts the Queen Mother’s chosen guards, often referred to by the fandom as Praetorians. Many changes are made by the Perry’s – most of which drastically improve upon the narrative of the original story – and one such one is the ending with the final solution to the Alien infestation. The book is actually smart and they set the bombs to go off with a timespan of months, allowing the Aliens around the globe to actually get to the Queen Mother once she is deposited on Earth. The mission to retrieve the Queen Mother isn’t actually sanctioned in the novel. It becomes an illegal mission with those involved very much dedicated to the mission and to wanting to end the Queen’s transmissions that are plaguing the sleep of the main characters. I liked that the military leadership was unwilling to go ahead with the plan showed some awareness of how silly it all sounded. All the characters receive significantly better development than their comic counterparts with most of the background characters becoming more than just a face and a nametag. They’re all largely likeable but no-one really jumps out as being massively interesting or memorable. The character focus remains on Billie and Wilks (and Ripley as we talked about her earlier) with Billie slowly and slowly becoming the true main character of the series. Throughout the trilogy she grows from being this scared little girl into a strong woman who would do anything for her “child”, mirroring much of Ripley’s development over the course of Aliens in regards to her relationship with Newt. This would have resonated better had the retcons not been required to change the characters but I still think her growth throughout the trilogy is fantastic and it was fun to read. Billie’s core story is about saving Amy, a girl trapped on Earth that she has been watching on the vid broadcasts since the infestation of Earth. I find it really satisfying to see this once broken character become so strong and so determined in her resolve. Billie is finally able to get chance to act upon her desire to save that little girl, like Wilks saved her when she was just a scared girl. Wilks is still front and centre but he’s takes a back-seat to Ripley and Billie in Aliens: The Female War. We do get a nice bit of backstory regarding Wilks childhood but most of his development focus remains on this love interest in Billie that Steve Perry added at the end of Aliens: Nightmare Asylum. I didn’t like it then and I still don’t like it throughout Aliens: The Female War. Their relationship was always one of a father and daughter. It still strikes me as very odd and doesn’t feel natural at all in the flow of the story. It feels very forced. Even more forced is the apparent understanding and reciprocation from Billie that comes out of nowhere at the very end of the book. 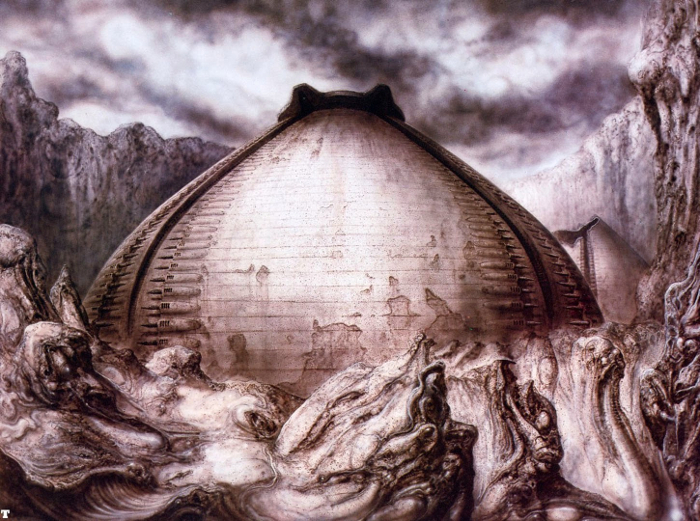 A piece of H.R Giger’s artwork from Alien for the Egg Silo/Pyramid before it was merged with the Derelict. Aliens: The Female War also opens up the expanded universe even further retconning the Alien world from the first novel, Alien: Earth Hive, to being one of many worlds taken over by the Aliens (and referred to in later stories as Hiveworlds). I do think both the comics and novels miss out on not describing these worlds as truly Giger-esque landscapes. Some of the comics utilize the original Egg Silo concepts that Giger did for Alien. The Perry’s do make a small reference to stone formations that are compared to “grotesque sculptures” but I never feel as if the biomechanical landscape or locales are ever properly utilized in the expanded universe and that was something Aliens: The Female War missed out on as well. Over all I believe that Aliens: The Female War was a drastic improvement over its comic counterpart. I do feel as if it missed a lot of amazing opportunities though and didn’t fix the real core issues of the narrative. However, like the preceding 2 novels I do feel that this story is an essential read for anyone interested in exploring the older expanded universe of the Alien series. From Corporal Hicks at Alien vs. Predator Galaxy, I award Aliens: The Female War with 6 out of 10. You can also read our reviews of Aliens: Earth Hive and Aliens: Nightmare Asylum. I would agree that the final solution of using a mother queen to allure all aliens to an elimination point is awful, and it appears whoever composes this story is getting rather desperate in finding a decent ending to the aliens occupation on earth.